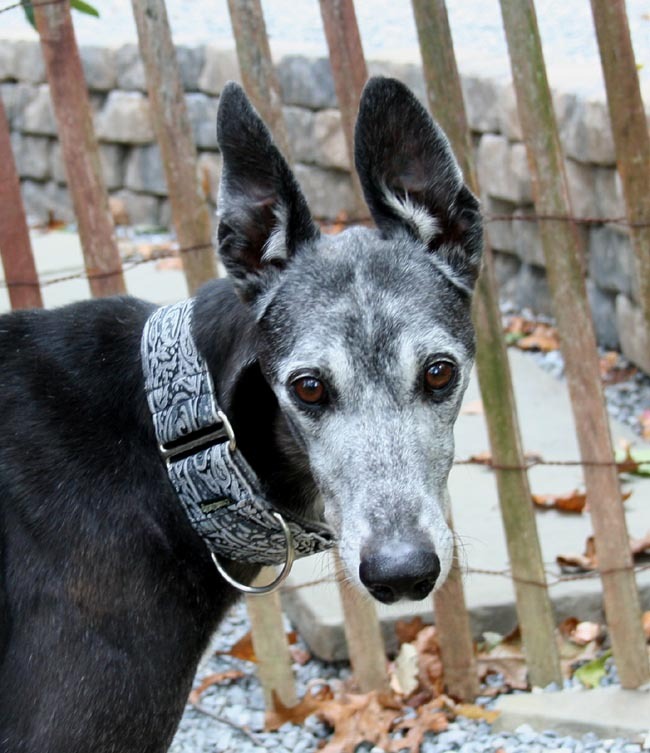 Mister – A Real Hound Hero! I have a story to share with all of you about my boy, Mister. I’ll need to give you a bit of back ground so you can fully understand the order of events that took place just this past Sunday morning. I have my boyz, Mister and King on a schedule due to working. We get up around 5:00 am so we can all go for a nice walk that usually last about 45 minutes. When we return home, I make them breakfast. They’re always hungry after their morning walk. Afterward, they curl up on their beds and sleep while I get ready for work. Before I leave, the last thing I do is take them around the block one more time. When we get back home, I give them each a treat (because they are such good boyz), a big ole hug and a kiss goodbye. Then I’m off to the office. No Matter how hard I try to get them to understand weekends are good for sleeping in just a bit.They don’t seem to care. I’ve even tried to get them to understand the difference between the words “work day” and “mommy day”… During the week when I get up I say “Good morning handsome boyz. Today’s a work day and mommy has to go to work”. On weekends I get up and say “Good morning my handsome boyz, today’s a mommy day and we get to spend the day together”. They wag their tails just the same everyday regardless of what I say. Oh well, I guess I can’t have it all… Back to the reason for this story. This past Sunday morning as we all know, it was dark, dreary and raining because of the huricane. It would have been a great day to sleep in, at least until 7 or 8:00. But that wasn’t going to happen at my house. Mister decided he was ready for his walk at 4:45 and wasn’t willing to postpone it at all. After throwing on a pair of jeans and t-shirt the boyz and I went walking. When we got home, I dried them off from the rain and made their breakfast. Since I was up, I thought I would get started on my weekend chores. I had poured myself a glass of ice tea which emptied the pitcher so I filled a large pan with water and put the tea bags in to brew. Then I put in a load of laundry. After having the house closed up for most of the summer due to the heat, I thought it would be a great day to open a few windows to let some fresh air in. I even put small window fan in the dinning room window drawing air out to help pull the fresh air in the other windows. I decided to work on some homework so I went to the den where I opened my laptop and logged into my class. By this time the boyz were both sound asleep on their beds. King was on his back with all 4 legs going in all four directions, his mouth open and his tongue hanging out the side of his mouth. Mister was stretched out on his side with his head totally off his bed, his mouth was open and he was actually snoring a bit. After working for a while my eyes began to get very heavy so I laid my head back and drifted off to sleep. Although I didn’t actually wake up, I heard Mister jump up from his bed and run to the kitchen. In my half waken state, I simply figued he heard Molly or Waggs (my shih tzu’s) and went to see what they were doing. But in just a matter of seconds he was back in the den staring at me and making a strange noise. Without opening my eyes I told him to be a good boy and go back to his nap. He left the den and just a few seconds later he was back again. This time he pushed his entire head under my arm and started pulling on it. I finally opened my eyes and told him to stop because he was going to cause me to drop my laptop off my lap. He was relentless and for the first time totally ignored my instuction. The tone of my voice became more firm and again I told him it wasn’t time to go out yet, we had not been back from the first walk long enough for his coat to fully dry. As my voice became more firm, so did he! He then started hitting me with his front paw. Needless to say, this caught me by surprise. I removed the laptop from my lap and stood to see what was bothering him. When I stood, I could smell something burning. I immediately thought the fan motor had overheated due to the wind blowing against it. I went to the dinning room, which was filled with smoke and turned off the fan. But the smoke was not coming from there. Something was burning somewhere in my house and the smoke was bellowing out of my kitchen! When I got there, the large pan I had filled with water and tea bags had boiled dry and was now on fire. I grabbed it, tossed it in the sink and turned on the water. I couldn’t believe I had forgotten all about it being on the stove. Through all of this, my Mister NEVER left my side. He was against my legs the entire time like he was making sure he protected me. Needless to say I hugged and kissed him as I thanked him from the bottom of my heart. Through it all… my cutie boy King never woke. As a matter of fact he was in the same position when I returned to the den as he was when I left…bless his heart. Needless to say.. I’m very proud of my boy Mister… he’s my HERO! I’m so blessed to have both my boyz in my life.